Love is definitely in the air or shall we say in the sky as Kapuso couple Jennylyn Mercado and Dennis Trillo go see the Aurora Borealis in Finland together. In a previous interview, Jennylyn mentioned that it took almost a year for them to book this vacation. Check out photos of the lovebirds below which they shared on their social media accounts. WATCH: Dennis Trillo and Jennylyn Mercado takes Katrina Aguila's "How Well Do You Know Me Challenge"
So how well do Dennis Trillo and Jennylyn Mercado know each other? Watch them as they take Katrina Aguila's "How Well Do You Know Me Challenge" as they answer questions such as "Who is Jen's first crush? ", "Dennis' favorite chocolate", "How Dennis would end this phrase, Love is ____" and many more. For every wrong answer, the couple were to face a consequence. Eating various food which aren't deemed to be very appealing to the taste such as ampalaya and siling labuyo. Katrina on the other hand would have to do the consequence each time Dennis and Jennylyn get matching answers. Watch the super funny and entertaining video below. Also. make sure to subscribe to Katrina's channel. Self-confessed music lovers, Kapuso couple Dennis Trillo and Jennylyn Mercado went record hunting at an independent music chain in Los Angeles, California. The Kapuso Drama King shared on his Instagram account a photo with the Ultimate Star at Amoeba Music. It's good to see Dennis and Jennylyn enjoying some time off after the success of their show "Sikat Ka Kapuso" for GMA Pinoy TV with Alden, Tom, Lovi, and Betong at Terrace Theater, Long Beach. At the press conference of the "Sikat Ka Kapuso" show in California, Ultimate Star Jennylyn Mercado reveals she plans to go diving with her family and loved ones on Valentine's Day. Dennis Trillo who was seated beside her was all smiles listening to Jennylyn as she was speaking with the members of the press. On the other hand, Jennylyn vows to exercise more this year and eat healthier as part of her New Year's resolution. 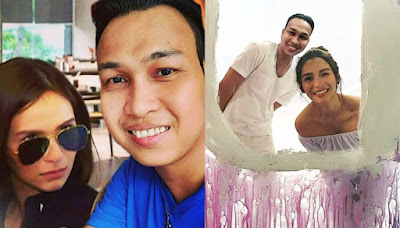 LOOK: This Man photoshops himself into Jennylyn Mercado's photos and it's totally funny! This guy will surely make your day! Check out how he photoshops himself into Ultimate Star Jennylyn Mercado's photos. Instagram user @ryel_yoboy base on his Instagram feed loves editing his photos in adorable and funny ways but it's apparent that his favorites are the ones with the award winning actress. Check out the super funny and cute photos below. LOOK: Dennis Trillo and Jennylyn Mercado exchange sweet messages on Instagram! Dennis Trillo and Jennylyn Mercado once again made their fans feel "kilig" as the the Kapuso couple exchange sweet messages on social media. Dennis and Jennylyn will soon fly to California for the "Sikat Ka Kapuso" event which will happen on January 22, 2017 at Terrace Theater Long Beach California. A few days after that, it has been reported that the Ultimate Star and the Kapuso Drama King will both take a short break from their showbiz commitments to see the Northern Lights. LOOK: Jak Roberto describes Jennylyn Mercado as his "Future Leading Lady"
Kapuso hunk Jak Roberto was all smiles as he posed for a selfie with his ultimate celebrity crush Jennylyn Mercado whom he described as his "Future Leading Lady". Both stars joined the Sinulog festivities in Cebu to promote their respective Kapuso shows. Meanwhile, the Ultimate Star responded to Jak's declaration saying "Aysus!!! If that's a promise, then aabangan ko yan ha." Our advice to Jak, keep dreaming and believing who knows after Gil Cuerva you could be next in line as Jen's next leading man after My Love From The Star. Years back, Jennylyn was just like you hoping to someday get to work with actors she looks up to. Look at her now. LOOK: Jennylyn Mercado and Gil Cuerva to join Sinulog Grand Parade in Cebu! The lead stars of the highly anticipated Pinoy version of My Love From The Star will be joining the Sinulog Festival this coming Sunday in Cebu. Jennylyn Mercado and Gil Cuerva will be joined by other Kapuso stars including Alden Richards, Maine Mendoza, and the cast of Meant To Be at the Sinulog Grand Parade. WATCH: Dennis Trillo hints duet with Jennylyn Mercado for the 'Sikat Ka Kapuso' event! Dennis Trillo revealed on an interview with GMA News program 24 Oras that he will be performing a duet with Ultimate Star Jennylyn Mercado for the "Sikat Ka Kapuso" event which will take place at Long Beach California this coming January 22, 2017. Other stars joining Jennylyn and Dennis include Alden Richards, Lovi Poe, Tom Rodriguez, and Betong Sumaya. Catch the Ultimate Star Jennylyn Mercado LIVE at Vista Mall Daang Hari this January 14, 2017, Saturday, at 6PM as she sing songs from her newest album 'Ultimate' under Ivory Music and Video. LOOK: Who is Kapuso hunk Jak Roberto's 'Ultimate' Celebrity Crush? Kapuso hunk Jak Roberto was asked by one of his Twitter followers who is his celebrity crush and the actor proudly answered no other than our very own Jennylyn Mercado. Prior to this Jak has been very vocal in his interviews about his admiration for the Ultimate Star and his dreams of someday getting the chance to work with her. In fact, in his recent Facebook live chat with his co-stars from his upcoming prime time soap, he narrated how starstrucked he was seeing the singer/host/actress when he appeared on Jennylyn's show Superstar Duets. ULTIMATE MALL TOUR: Jennylyn Mercado LIVE at Starmall San Jose Del Monte! Catch the Ultimate Star Jennylyn Mercado LIVE at Starmall San Jose del Monte this January 8, 2017, Sunday, at 4PM as she sing songs from her newest album 'Ultimate' under Ivory Music and Video. With special guests, Zack and Fritz. WATCH: Piolo Pascual reveals actresses he wants to work with. Jennylyn Mercado makes it on the list! Despite network rivalry, anything is possible nowadays. Proof of this is the unexpected team up of Jennylyn and Kapamilya Network's box office and award winning actor John Lloyd Cruz in Star Cinema's Just The 3 Of Us. Now, in a recent interview another ABS-CBN top leading man names the Ultimate Star as one of the actresses he hopes to work with. This is no other than the Ultimate Heartthrob Piolo Pascual. This is exciting as the two are from different networks and both are known for having chemistry to whoever they get paired with. If things will materialize, this will become their first project together. A few weeks ago, Jennylyn and Piolo were spotted at Belo's Christmas Party. In fact, a photo of them with Cristalle Belo and Baby Scarlet Snow was shared by Dra. Vicki Belo herself. Calling the attention of Star Cinema. Please make this happen! LOOK: Jennylyn Mercado and son Alex Jazz welcome the New Year with matching outfits! Ultimate Star Jennylyn Mercado and son Alex Jazz Mercado look so adorable with their matching outfits as they welcome the New Year. It has been believed to be lucky to wear red and polka dots in celebrating the New Year and the single mom and her 'pogi' son did just that, keeping with tradition. Check out the photos Jennylyn shared through her Instagram account below.